It’s obvious that the market is not only improving but consistently strong. 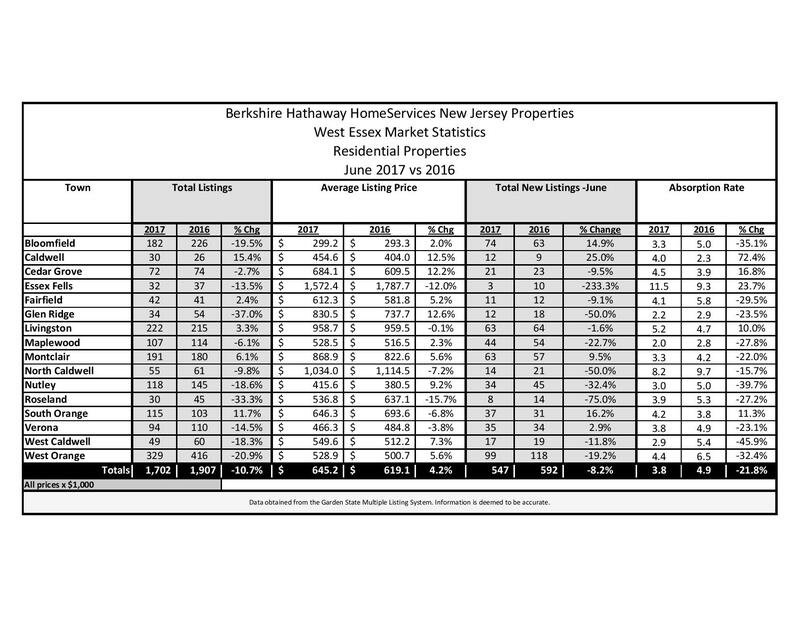 Number of closings are up, days on market are down, sales prices are improving and sellers are getting a larger percentage of what they ask. There are some outliers also. Caldwell’s sales prices are down slightly on average, North Caldwell’s ratio of price vs. sale price is down 3 percentage points. 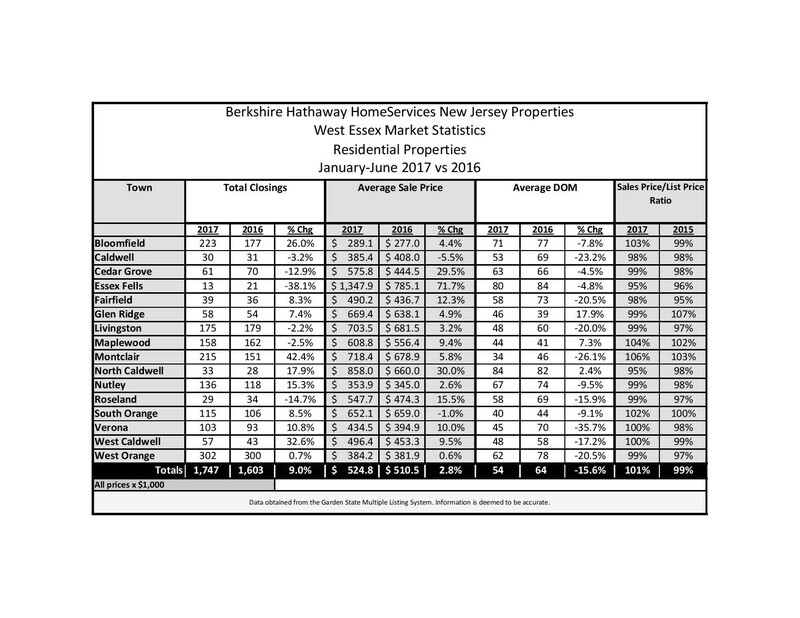 Here’s a surprise: Glen Ridge, the Essex County top performer for many months has seen its sales prices rise almost 5% year over year but its days on market are up by a week and, most significantly, its price vs. sale price is down by 8 percentage points. The major difference between the current market and the boom market we experienced until 2007 is that not every metric is improving for every town. Also the improvement is more gradual which is a good thing. Statistics aside, I have seen bidding wars break out in all the usual, popular towns and I’ve noticed it has spread beyond those borders into towns that traditionally don’t enjoy that phenomenon, Buyers need to be disciplined and resolved. The number of listings and average list price, year over year, as reflected in this table is of minimal importance in my opinion. Listings come on for a variety of reasons, not necessarily indicative of a trend and sellers, sometimes, list for prices that defy reason so I don’t look for patterns there. The most important statistic here is the absorption rate for each town which is calculated by dividing the number of active listings in a given period of time by the number of solds in the same time period. The resulting number expresses the number of months it will take that market to absorb (sell) what’s actively on the market. There is noticeable improvement, things are selling more quickly but there’s also more outliers here. There are 5 towns in suburban Essex where the absorption rate has gone up. Maybe not significantly, but up nonetheless, except for Caldwell which seems to have taken a beating. The conclusion to be drawn from all this is that the market is performing the way it was predicted to perform since before the recession ended. The pundits said the housing market would improve and gain momentum but at a normal pace with normal, gradual appreciations. This is healthy, especially since the market is as robust as it is recently. Will this continue? It all depends on what segment of the market you’re buying or selling in. For example, the 1.5 million plus segment is in a significant pause as of this writing whereas it was white-hot only a few months ago. The segments under a million are consistently selling with competition but they must present well or else they will sit. That happened even in the boom years. You will also notice that different towns have different stats, some faster and more expensive than others. As the economy improves the interest rates will inch upward and the Federal Reserve is getting ready to release a ton of bonds into the market which will also have an effect on interest rates. Higher rates may push some buyers out of the market, as will increased property taxes. If health care spending changes and/or the tax code changes, that will certainly effect buyer confidence and ability to buy. For now, pragmatism and discipline should prevail on the part of seller and buyer. In fact, those are good practices no matter what the market conditions.